Piers Barber is left dumbstruck by a rare in-full performance of Spiritualized’s vital cosmic masterpiece Ladies And Gentlemen We Are Floating In Space at London’s Barbican. 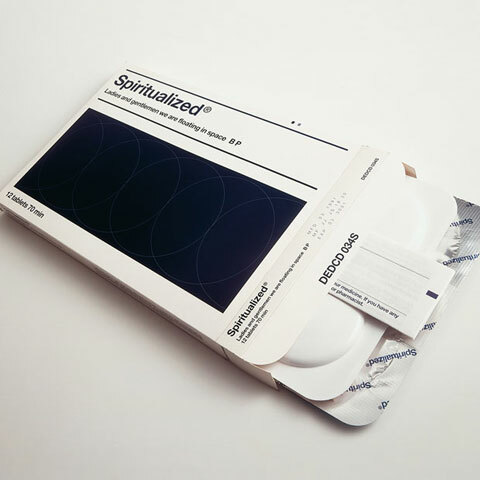 It’s a rare and personally unprecedented privilege to witness a full-length performance of Ladies And Gentlemen We Are Floating In Place, Spiritualized’s beguiling 1997 masterpiece and lead singer Jason Pierce‘s defining work. It is, of course, easily and occasionally justified to be cynical about the current trend in live music which has seen older artists resort to revisiting former glories in full. Yet there is something undoubtedly heartwarming about seeing hundreds of fans descend on London’s Barbican tonight, all united in their persistent fascination with this strange and enduring album – now approaching almost twenty years of age. Pierce rarely indulges his fans in a single full performance the record, let alone two in two nights, which is the arrangement this time round after a first date sold out in rapid time. Tonight the Barbican’s magnificent Hall is completely full, despite hefty ticket prices of around £60. (I nabbed my ticket, located dead centre in the Circle, for just £15 through the Barbican’s Young Barbican scheme – it’s an incredible offer). Tonight Pierce, the brains behind the band and its only ever-present, is joined by a sizeable group: a drummer, bassist, keyboardist, percussionist and two guitarists. And that’s not all – he’s brought a few other friends along too, with the Barbican’s expansive stage packed with large strings and horns sections and an enchantingly talented gospel group, pristine in pearly white gowns. Silently, Pierce (t-shirt, skinny jeans, sunglasses) takes a seat stage left – he stays sitting the entire performance, and has said nothing but a single humble “thank you” as an aside by the time the night is out. Pierce is certainly no one album-hit wonder, having hit important heights on records such as Taking Drugs To Make Music To Take Drugs To (with his first band Spacemen 3) and the 2001 Spiritualized effort Let It Come Down. Even Songs in A&E, Pierce’s most recent release, is a notable triumph, especially considering how close he came to death following a bout of bilateral pneumonia in 2005. Yet Ladies And Gentlemen… exists in an altogether different space. It’s timeless, ambitious and immaculately produced, telling the sort of lengthy and carefully curated story that has been rendered all but extinct in today’s impatient era of Spotify track accessibility. It’s far more than just alternative rock: it’s roots blues, soul and folk, flavoured throughout by generous splashes of tasteful gospel which reflect Pierce’s deep fascination with the spiritual. Its potency lies in an inspired merging of contrasts: moments of humbling heartbreak manifest themselves in haunting strings and delicate ballads, while cacophonies of rapid-fire drums, chaotic percussion and walls of guitar reflect outbreaks of visceral anger, madness and confusion. An audience prepared for a moving experience are still taken aback by the beauty of the album’s opening title track, which is punctuated so tastefully throughout by the mesmeric echoed vocals of Elvis Presley’s ‘Can’t Help Falling In Love.’ It turns out that the song’s echoing refrain – “all I want in life’s a little bit of love to take the pain away” – sounds even more haunting delivered in a live space than on record. Indeed, the album retains all its power, and here, in a show which extends to around two hours, its intricacies and excesses are fully indulged and explored. Highlights include the reverberations of ‘Come Together’’s mighty riff, an achingly desperate ‘Stay With Me,’ and the swinging refrain of ‘Think I’m In Love’. The brilliantly named ‘No God Only Religion’ tears through the arena with a remarkable urgency, while the impeccable delivery of ‘Broken Heart,’ an impossibly gut-wrenching song about a lost love, is complimented tastefully by disco ball-infused lighting. The main show concludes with the tumultuous ‘Cop Shoots Cop’ (“Hey man there’s a hole in my arm where all the money goes”), the album’s 17-minute closer which descends into a wall of ecstatic chaos, before angelic vocals gradually seep through to soothingly bring Ladies And Gentlemen… to a redemptive close. It’s stunning. The full band return to the stage after an extensive standing ovation to perform a soaring and soulful ‘Out of Sight’ (“Standing space is all the space I can stand, / Gravity just keeps on keeping me down”) and Pierce’s conventional closer, his band’s smart cover of ‘Oh Happy Day,’ which is fittingly liberally punctuated by stunning gospel backing throughout. Tears, shivers, and hands clasped in awe over agape mouths are visible throughout the performance, and a stunned audience exit the arena in a respectful hush. It’s clearer than ever that this is a captivating, precious kind of album, one which reveals itself even more potently when performed to a crowd in full. Its unique light still shines almost two decades after its original creation. Follow Piers and the Music Factory on Twitter @piersbarber18 and @MusicFactoryNo1.